A bright smile is even better with evenly white teeth! A bright smile can open many a door. It looks even more attractive with natural white teeth. If you are not satisfied with the colour of your teeth we can whiten them using a gentle bleaching procedure in our practice. With the ZOOM! 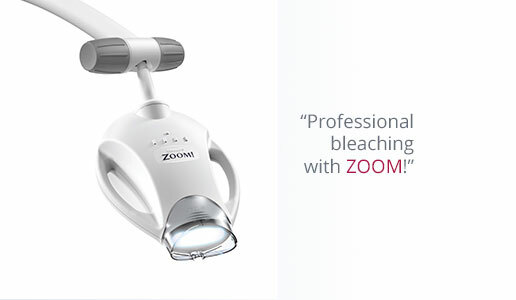 teeth whitening system excellent results are achieved rapidly, without damaging the teeth. For this procedure, a mild whitening gel is applied to the teeth to be treated. A specially developed LED lamp enhances the effect of the hydrogen peroxide in the gel. The gel remains on the teeth for 15 minutes. In the process oxygen is released, which then penetrates the tooth surface to clear internal discoloration. The procedure can be repeated three to four times depending on the desired degree of whitening. Up to eight levels are possible if desired. The effectiveness and safety of this method has been proven in clinical studies. Even 30 days after treatment, the teeth were much brighter than those treated without the lamp method. 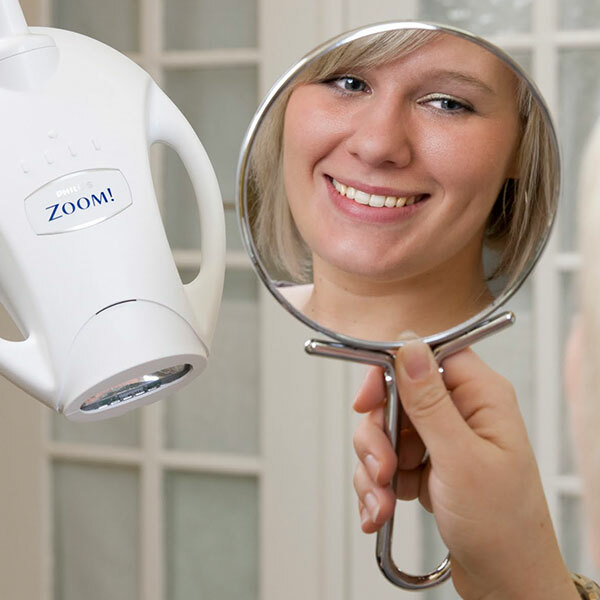 With careful dental care, the effect may last for one up to three years. Teeth whitening is most effective when the teeth are free of dental plaque. For this, we perform professional tooth cleaning prior to treatment. An oral examination is always performed to determine how your teeth will respond to treatment and to rule out contraindications. Whitening is generally not recommended if the enamel is damaged, for children under the age of 13, pregnant women and nursing mothers. The colour of fillings and dentures does not change due to bleaching. Necessary restoration measures must therefore be carried out before or after. Ask us. We are happy to help.